Photos of the first commercial motherboard to support USB 3.0 and SATA 6 GB/s speeds have been released by â€“ you guessed it â€“ a Chinese hardware forum. The motherboard is for Intelâ€™s X58 platform (Core i7 for the n00bs) and supports six triple channel DDR3 memory slots, and three PCI Express 2.0 x16 slots among other features. As the name implies, the board is aimed at the upper end of the mainstream and enthusiast market and thus would be priced around $250 for sure. Among other things, it has eight SATA ports, ten USB 2.0 ports (six onboard), two Firewire (one onboard) and an IDE port. 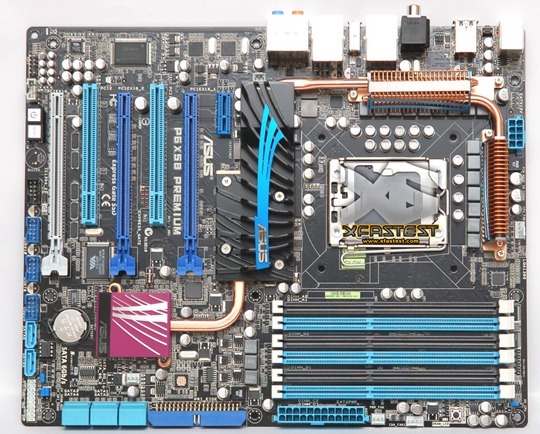 For expansion, the board has two legacy PCI slots and a PCI Express x1 slot. You also get dual gigabit LAN, optical and coaxial audio out along with the regular 8 channel audio. Overall, it sounds like a good board though only hands on testing would reveal just how good it is. Head over to XFatest for more photos. Ran 14 queries in 0.149 seconds.